A Great book that ties in history of that time with a wonderful story. Kept the 5th grade class adding for "just one more chapter." In FIRESTORM! you will meet Poppy – a sad little pickpocket who lives in a basement in old Chicago. You’ll also meet Justin and his sweet little goat “TickTock.” This story is written with two viewpoints. I loved each character so much, I decided to give them “equal time” which is a unique style for me. I’d appreciate hearing from you and knowing how much you like that new style of alternating chapters. See the drawing below? When I discovered this drawing tucked away in Chicago’s Historical Archives, I knew I had discovered the characters for my book FIRESTORM. Do you see the boy in the back? His name was Justin – and he brought his pet goat through the fire to safety. I named the goat, “TickTock” and she is another favorite character in my book. There was a letter attached to the picture that tells how his mother’s dress caught on fire as they were escaping the fire. (I used that incident in the book, too.) See the wheelbarrow his brother is pushing in the front? That’s how many people carried their most precious possessions to get away from the firestorm. 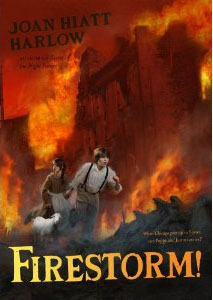 As I wrote and researched FIRESTORM I discovered what REALLY started the Chicago Fire. And it wasn’t Mrs. O’Leary’s cow!